Recently, the Information Technology Industry Council, which represents companies like Amazon, Visa, Microsoft, Google, Facebook, and Apple, released its “Framework to Advance Interoperable Rules (FAIR) on Privacy”. On the surface, it looks like tech companies are trying to protect user privacy. In reality, they want to make sure that they can continue to profit off of our data. Using simple privacy tools like DeleteMe and Blur will help you stay in control of your privacy. There is a new internet privacy scandal almost every week–hackers accessed information on 57 million Uber riders, thieves stole 143 million Equifax customer files, 50 million Facebook users’ accounts were breached–the list goes on. 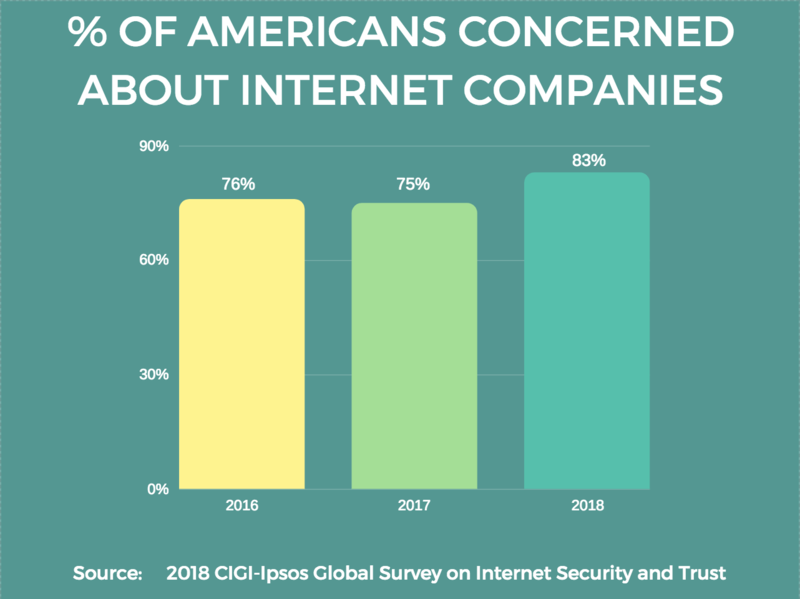 83% of Americans said that internet companies specifically are a source of growing concern, according to the Centre for International Governance Innovation (CIGI). 62% of Americans believed that social media has too much power. That statistic was collected before the Cambridge Analytica scandal, and likely to now be even higher. It’s clear that Americans should, and do want protection from major tech companies. Tech companies know that they have nothing without their users’ data, and for that reason have begun to push for privacy laws in an effort to be a part of their shaping–and to have them serve industry interests. If they’re successful, it’s likely the regulations won’t actually protect consumer privacy. We’ll end up with poor regulation that protects the tech industry’s source of profit: the sale of our personal data. In the past, the Tech Industry has spent a lot of money opposing consumer privacy legislation. But recently, they have become aware of the growing public support for privacy laws, and are trying to stay ahead of the curve. They’ve updated their privacy policies, created simplified ‘privacy centers’, and enhanced their security features. This helps them look as though they are changing their ways and prioritizing user privacy–but it’s not enough. They’re still collecting and using our data in ways that are not made clear. 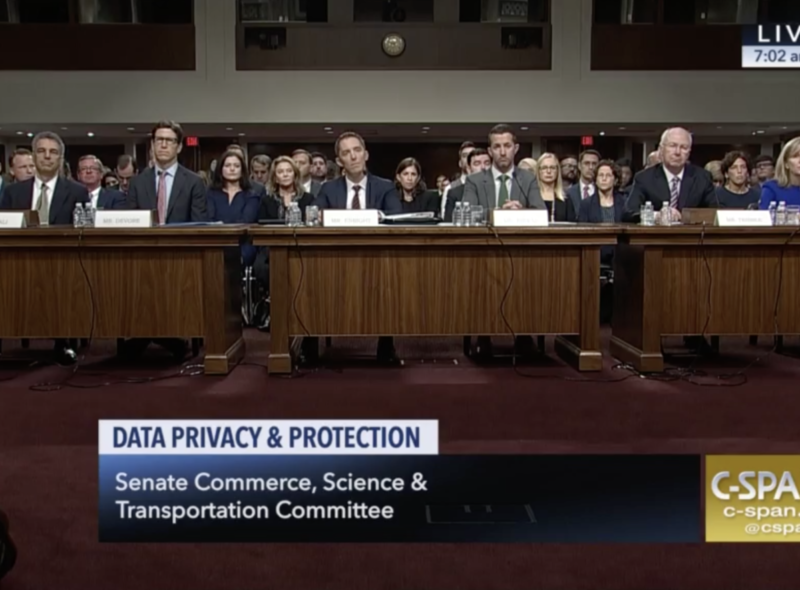 Amidst the push for online privacy regulation, the Senate invited executives from the largest tech giants to discuss national law on consumer data privacy. 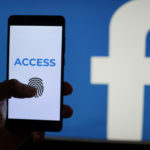 The representatives made grand claims about their support of user privacy but were reluctant to go into the specifics of what a national data privacy law could look like, making it clear that they don’t have much interest in taking user privacy seriously. For all tech giants, their entire business models rely on selling and sharing users’ personal data. They profit from running targeted ads; relying on collecting, sharing, and analyzing vast amounts of user data. So, they see privacy regulation as a threat to their data-reliant businesses. From left to right: Len Cali (AT&T), Andrew DeVore (Amazon), Keith Enright (Google), Damien Kieran (Twitter), Guy “Bud” Tribble (Apple), and Rachel Welch (Charter Communications) testify before the Senate Commerce Committee. 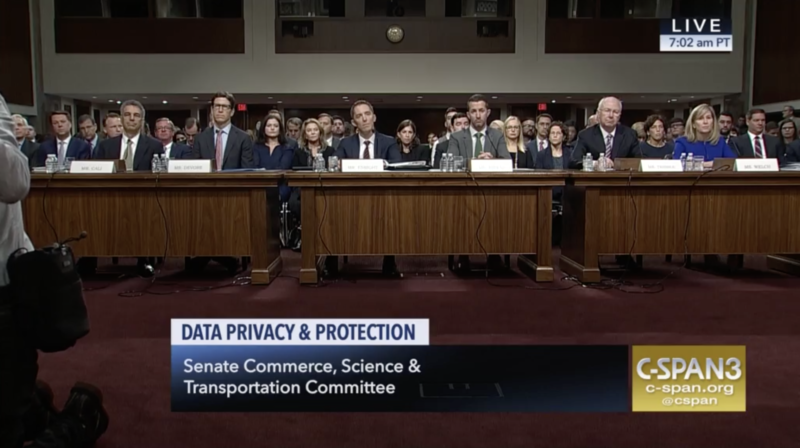 While five tech industry representatives were able to testify at the Senate hearing, no consumer interest groups were invited– shocking. Instead of a fair law protecting our privacy, we could end up with a weak law–or worse, one that protects tech companies’ ability to sell our personal data. 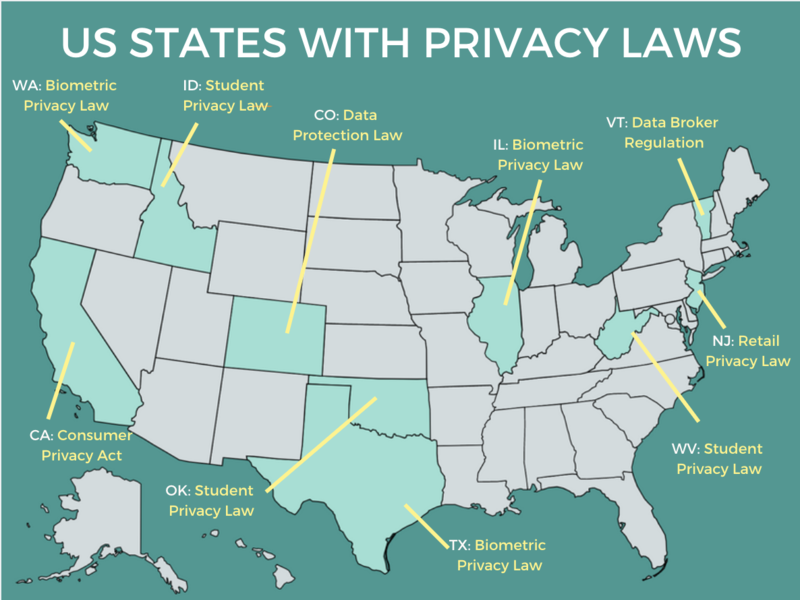 Vermont, Colorado, Texas, New Jersey, Washington, and Illinois have all passed laws protecting consumers private data; while Idaho, West Virginia, and Oklahoma passed laws protecting student privacy. The tech industry already fought and reshaped laws passed in these states, and prevented laws from being passed in others. Internationally, the EU’s General Data Privacy Regulation (GDPR) is the world’s farthest-reaching data regulation to date. In the U.S., The California Consumer Privacy Act (CCPA) provides similar protections as GDPR, except it uses an opt-out method to controlling data sharing instead of the opt-in method that GDPR uses. Although the CCPA doesn’t go into effect until 2020, it’s already making a big effect on the tech industry: they’re already pushing against CCPA, and trying to ease its regulations. What should a federal regulation look like? More transparency in company privacy policies, clearly outlining what data is collected and what happens to it. Meaningful consumer consent, not just “click-through consent”. 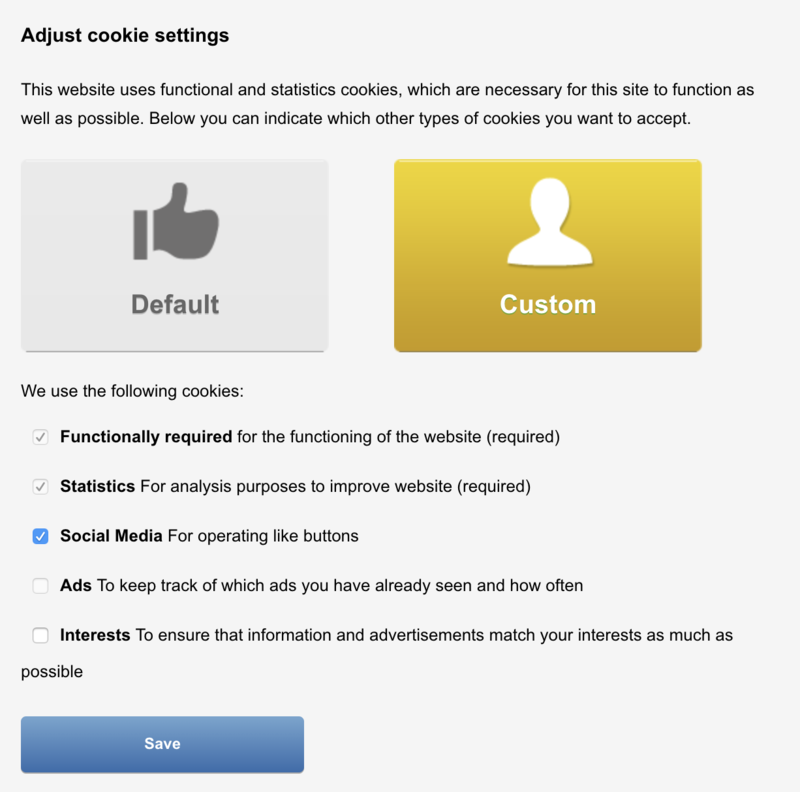 Users should know what they are agreeing to when they give consent, and adjustable options should be given. Users should be able to access the personal information that companies have about them, and have it deleted. “Personal information” should be defined broadly. This gives users more control over how personal information is shared. State privacy laws should be supported, not overruled. Existing privacy laws that protect consumers should remain in place, supported by federal legislation. These guidelines are meant to put user privacy interests in front of business interests. It’s in tech companies interests to make user privacy a priority–if consumers don’t trust the company with their data, they will not use the service. There are a few ways that you can stay on top of your privacy. Contact your local legislators to let them know that this is an issue you care about. Tell them how it’s wrong for the tech industry to shape privacy laws and that consumer privacy interests to be prioritized. Support organizations fighting for privacy laws, like The ACLU, The CDT, The EFF , EPIC, and The Privacy Rights Clearinghouse. Stay in control of your data sharing with Blur. It’s your data, you don’t have to give it just because a company asks for it. With Blur, you can provide ‘Masked’ Info instead of your real info when filling out online forms. This way, companies won’t be able to store and share your real information. Protect yourself with DeleteMe. Your personal information–like your name, address, phone number, and other information–is floating around the internet on data broker websites. DeleteMe is the best service to remove personal information from Google, reducing your online footprint and protecting your personal information.